The knee is the body's largest joint. It consists of the femur and the tibia, which meet to form a hinge joint. The joint is protected by the patella (kneecap), and cushioned by articular cartilage that covers the ends of these bones. The arthroscope is a fiber optic instrument (narrower than a pen) which is put into the knee joint through two small incisions. A camera is attached to the arthroscope and the image is viewed on a TV monitor. The arthroscope allows me to fully evaluate the entire knee joint, including the knee (patella), the cartilage surfaces, the meniscus, the ligaments (ACL & PCL), and the joint lining. Small instruments ranging from 3-5 millimeters in size are inserted through the incisions so that I can feel the joint structures for any damage, diagnose the injury, and then repair, reconstruct, or remove the damaged tissue. Before the development of arthroscopy, large incisions had to be made over the knee joint to treat or diagnose injuries. Today's arthroscopic techniques allow more complete evaluations of the knee joint while accelerating the rehabilitation process. What kinds of procedures can be performed with the arthroscope? What are some of the possible complications of surgery? While complications are not common, all surgery has associated risks. Possible complications include stiffness of the knee after surgery or continued pain. The use of arthroscopic techniques attempts to limit these complications. Other complications include infection, bleeding, nerve damage, blood clots, or problems with the anesthesia. If a meniscus repair is performed, it is possible that the torn area will not heal. This would require a second surgery to remove the torn meniscus. Even though this is possible, it is better to attempt to repair a meniscus that may heal, in order to preserve the normal meniscus function. Knee arthroscopy can be performed with general anesthesia (going to sleep), or regional anesthesia (spinal or epidural block). The type of anesthesia will depend on your choice. The anesthesiologist will discuss your options the morning of surgery. Knee arthroscopy is an outpatient procedure you will go home the same day. The day before surgery you will be told what time to report to the hospital or surgery center. You will be admitted and taken to a pre-operative holding area where you are prepared for surgery. You will be asked several times which extremity I am operating on. Please note that you are asked this question many times on purpose. After the operation you will be taken to the recovery room to be monitored. Once the effects on anesthesia have worn off and your pain is under good control, you will be given your post-operative instructions and prescription for pain medication and released. Please be aware that the process of getting checked in, prepared for surgery, undergoing the operation, and recovering from anesthesia takes the majority of the day. I would recommend that you and your family members bring along some reading material to make the process easier for all. How should I care for my knee after surgery? You may shower, but you should keep the dressing dry. After your dressing is removed, 2-3 days post-op you may get your knee wet. You cannot take a bath until the wounds are completely sealed, usually 2-3 weeks after surgery. You will be instructed how to use crutches before the surgery. You should bring a set of crutches with you to the surgery. How long you use crutches will depend on the type of surgery performed. Crutches are commonly only required for a couple of days, unless you had a meniscus repair, in that case I will let you know how long you should stay on your crutches to protect the repair. If a meniscus repair is performed, you will receive a brace to restrict the motion of your knee. This is to protect the repair for the first 4-6 weeks, to allow the area to heal. You should apply ice over the dressing for 20 -30 minutes every hour for several days. Do not use heat for the first 48-72 hours. Some stitches are absorbable and do not need to be removed. However, if there are stitches they will be removed on your first post-op visit. You can return to school or work anywhere from 2 days to 2 weeks. If you job involves more extended walking or heavy activity, you may be out of work or school for a longer period of time. After partial meniscectomy, the rehabilitation generally occurs very rapidly. Most patients can return to strenuous work in four to six weeks. However, you complete recovery may take 2-3 months to get all your strength back. Following meniscus repair, you will be restricted from performing certain activities. The specific rehabilitation protocol will be reviewed with you after surgery. When can I return to sports or full duty at work? The meniscus is a wedge shaped cartilage ring found on both the inside and outside of the knee between the femur (thigh bone) and tibia (shin bone). The menisci act as shock absorbers in the knee, and provide stability to the joint. The meniscus is usually injured by twisting on a planted foot or squatting down and forcefully bending the knee. Occasionally, the tear occurs with very little stress on the knee. The tear can also be degenerative, meaning that the tear occurs because the tissue is worn out over time due to arthritis in the knee. How do I know my meniscus is torn? Most tears of the meniscus lead to knee pain in the area of the tear, on the inside or outside of the knee. Swelling of the knee may also occur, as well as pain that can radiate down the leg. Occasionally, locking and catching of the knee can occur, when the meniscus gets wedged in between the bones of the knee. Pain and instability caused by the meniscus tear can also cause the knee to buckle or "give way". Twisting activities usually worsen the symptoms. Do I need x-rays, a MRI, or any other tests? A set of x-rays may be ordered to evaluate the knee for arthritis or a fracture of the bones. 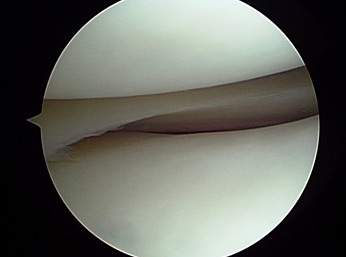 Many times the diagnosis of a meniscus tear can be made through the examination in the office. However, in most cases a MRI can be helpful to confirm the tear and rule out any other injuries to the knee. Is there usually any other damage to the knee when the meniscus is torn? Ligaments in the knee can be injured at the same time as the meniscus, depending on how your knee was injured. In addition, there can be an injury to the joint surface (articular cartilage) at the time of injury. If surgery is required, damage to the joint surface will be evaluated and treated at the time of your arthroscopy. Some people with meniscus tears will respond to conservative treatment, including rest, medications, and physical therapy. Meniscus tears do not heal, and over a period of time your knee joint will grind out the tear. In some cases, cortisone injection can also be helpful to resolve the pain and swelling. Whether or not you are a good candidate for conservative treatment will depend on the type of tear, age of the tear, and your desired activity level. Most people that have a meniscus tear go on to have a knee arthroscopy to help to resolve their symptoms. Meniscal surgery is performed by arthroscopy. The arthroscope is a fiber optic instrument (narrower than a pen) which is put into the knee joint through two small incisions. A camera is attached to the arthroscope and the image is viewed on a TV monitor. The arthroscope allows me to fully evaluate the entire knee joint, including the kneecap (patella), the cartilage surfaces, the meniscus, the ligaments (ACL & PCL), and the joint lining. Small instruments ranging from 3-5 millimeters in size are inserted through the two portals so that I can feel the joint structures for any damage, diagnose the injury, and then repair, reconstruct, or remove the damaged tissue. Before the development of arthroscopy, large incisions had to be made over the knee joint to remove the entire meniscus. Today's arthroscopic techniques allow more complete evaluations of the knee joint while allowing me to only remove the damaged portion of the meniscus, or to repair the meniscus if possible. What is the difference between partial meniscectomy and meniscal repair? Depending on the type of tear, the piece of meniscus that is torn may be removed from the knee (partial meniscectomy) or repaired (meniscus repair). Whether or not a tear is repaired depends on the likelihood of the tear healing. If a tear occurs in the outer one-third of the meniscus (peripheral tear), there is usually adequate blood supply for the tear to heal if fixed. However, tears in the inner two-thirds (where most tears occur) have no blood supply, and will not heal with repair. Therefore, the torn piece needs to be removed. Every effort is made to try and repair a tear that may heal. If the tear is repaired the overall recovery time is increased because I have to protect that repair. Don't I need my meniscus? It is always best to have your own normal meniscus. For this reason, every attempt is made to repair a meniscus tear that may heal. However, for tears that are torn beyond repair, it is best to remove the torn piece. The piece that is torn does not function like a normal meniscus, so removing that piece does not decrease the amount of functioning meniscus. Leaving a torn piece may irritate the knee joint and cause the tear to get larger. Only the portion of the meniscus that is torn or diseased is removed. Some stitches are absorbable so they do not need to be removed.. However, if there are stitches they will be removed on your first post-op visit. You will be instructed on exercises you can begin immediately after the surgery. The anterior cruciate ligament (ACL) is one of the main ligaments in the center of the knee. It runs from the front of the tibia (shinbone) to the back of the femur (thighbone). It assists in proper movement of the knee joint, and prevents the tibia form slipping forward on the femur. Abnormal translation can create and unstable knee that "gives way" during activity. The ACL is most commonly injured during a twisting or pivoting episode of the knee when the foot is planted on the ground. This can occur during such sports as football, soccer, basketball, or skiing. It can also be injured during a direct blow to the knee, or with hyperflexion or hyperextension of the knee. How do I know my ACL is injured? Usually a tear of the ACL results in sudden pain and giving way of the knee. Many patients report having felt or heard a "pop" when they injure their knee. In addition, the knee commonly swells within the first 1 to 3 hours after the injury. If the injury to the ACL is more chronic in nature, the injury most commonly leads to shifting or giving way of the knee with activity. The examination in the office usually can almost always determine when there is significant ACL injury, by testing the ability of the ligament to prevent the tibia from moving forward on the femur. If the injury just recently occurred, it can be difficult to tell if the ligament is injured because the patient does not like the knee to be moved around during the examination. Do I need x-rays, MRI, or any other test? A set of x-rays is usually ordered to evaluate the bones around the knee. The x-rays are primarily used to evaluate for fractures or arthritis about the knee. A MRI may be ordered to look for damage to the ACL and rule out any other injuries to the knee such as a meniscus tear or bone bruise. Other ligament or cartilage injuries can occur in combination with injuries to the ACL, which can be seen on the MRI. A KT-1000 Knee Ligament Arthometer is another test commonly performed in the office to evaluate how unstable the knee may be. Is there other damage to the knee when the ACL is injured? Other ligaments in the knee can be injured at the same time as the ACL. The most common ligament to also be injured is the medial collateral ligament or MCL. This ligament is on the inside of the knee, and prevents the legs from moving inward. In many cases there is a meniscus tear that occurs at the time of the ACL injury. 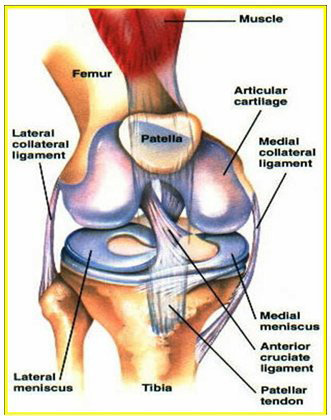 The medial and lateral meniscus are the cartilage rings which sit on thee inside and outside of the knee. Some meniscus tears can be repaired (fixed), others need to be trimmed back so that the torn edges are smooth (partial meniscectomy). Whether or not the meniscus can be fixed or need to be trimmed depends on the location, the size, and the age of the tear. All attempts are made to try and repair a meniscus that will heal. In some cases, there is also injury to the articular cartilage (the cartilage surface of the knee). The MRI will usually detect this injury, but in some cases it is not seen. This injury will also be addressed at the time of surgery, if necessary. What are the treatment options for ACL injuries? The ACL cannot heal on its own, but not all tears of the ACL need to be fixed with surgery. Whether or not the ACL needs to be treated depends on your desired activity level. The ACL is most important with cutting and twisting sports, such as tennis, basketball, soccer, skiing, etc. People with strenuous jobs involving heavy lifting and climbing also usually need their ACL. People who are unwilling or unable to modify their activities and desire an unrestricted lifestyle are encouraged to consider ACL surgery. People who lead a more sedentary lifestyle may be able to get by with exercise and a brace to stabilize the knee. However, some people may experience instability with simple activities such as going down stairs or stepping off a curb. In these cases, surgery is recommended to restore normal everyday activities and prevent further damage to the knee. Since the ACL does not heal, the ligament needs to be replaced (reconstructed). The ACL is reconstructed using arthroscopic assisted techniques. The arthroscope is a fiber optic instrument (narrower than a pen) which is put into the knee joint through small incisions. A camera is attached to the arthroscope and the image is viewed on a TV monitor. The arthroscope allows me to fully evaluate the entire knee joint, including the kneecap (patella), the cartilage surfaces, the meniscus, the ligaments (ACL &PCL), and the joint lining. Small instruments ranging from 3-5 millimeters in size are inserted through the incisions so that I can feel the joint structures for any damage, diagnose the injury, and then repair, reconstruct, or remove the damaged tissue. In ACL reconstruction, a replacement graft (ligament) is positioned in the joint at the site of the former ACL and then fixed to the thigh and lower leg using a metal button, and small plate with post. Although the ACL reconstruction is performed primarily with arthroscopy, a small open incision is needed to place the ligament in the knee. Depending on the type of ligament graft used, and incision may be needed to obtain (harvest) the graft from your knee. What kind of graft is used for the new ligament? Choices for the type of replacement graft include autografts (using your own tissue) or allografts (donor tissue from a cadaver). Autograft tissue used for ACL Reconstruction can either be from your patellar tendon (central 1/3 patellar tendon) or the hamstring tendons. The central 1/3 patellar tendon is taken with a small piece of bone from the patella and the tibia. It requires an incision on the front of the knee. It is the graft that has been used the longest, and is the most common graft performed. It has excellent long-term results, and is the graft used for most professional athletes. The disadvantage of a patellar tendon graft is that it can cause more pain for the first several weeks after surgery, and can lead to pain in the front of the knee in a small number of patients. A hamstring autograft is taken from a small incision towards the inside of the knee. The graft also has excellent results, but has not been used as long as the patellar tendon grafts. Its disadvantage is it can lead to some weakness in the hamstring muscles. It is commonly used in patients who may be predisposed towards pain in the front of the knee. Allograft tissue is tissue donated from a cadaver. They are also strong grafts with excellent results for ACL reconstruction. Because the tissue is not taken form your body, the surgical time and operative pain is less. This allows generally for an easier rehabilitation. The tissue is rigorously screened for infections, including HIV and Hepatitis. The disadvantage to the allograft tissue is that it has a slightly increased failure rate compared to the autograft tissue. While complications are not common, all surgery has associated risk. Possible complications include stiffness of the knee after surgery or continued pain. The use of arthroscopic techniques attempts to limit these complications. In addition, there is a risk of continued instability or rupture of the ACL graft. Other complications include an infection, bleeding, nerve damage, blood clots, or problems with the anesthesia. When should my surgery be performed? ACL surgery is not an emergency. In fact, it is extremely important that we delay your surgery until some of the inflammation in your knee quiets down. The goal of waiting is to allow you to regain full motion back in your knee prior to surgery. In general, this takes 2 to 3 weeks for most patients, but it can vary. The reason to wait until full motion is achieved is that loss of motion before surgery can make it more likely for the knee to become stiff after surgery. ACL reconstruction is usually performed with general anesthesia (going to sleep). If you go home the same day you will be given a femoral nerve block to control post-operative pain. Most patients are able to go home the same day; rarely others spend the night for a 23-hour stay. This depends on your comfort level with going home and managing the post-operative pain on your own. I will talk with you more extensively about it in the office and in the hospital the day of surgery. You may shower, but you should keep the dressing dry. After your dressing is removed you may get your knee wet. You cannot take a bath until the wounds are completely sealed, usually 2-3 weeks after surgery. You will be instructed how to use crutches before the surgery. You should bring a set of crutches with you to the surgery. Crutches are commonly used for the first 1 to 2 weeks post-op. The therapist will work with you to get you off your crutches when it is safe. You will receive a brace for your knee that you will wear for the first two to four weeks after surgery. The brace is locked in full extension (knee straight) because that is the hardest motion to get back after surgery. When you are not walking you may take the brace off intermittently to work on your exercises. You should apply ice over the dressing for 20 -30 minutes every hour for several days. Do not use heat for the first 48-72 hours. You may be supplied with a continuous cold therapy unit, use this as directed. Your stitches will be removed at your two-week office visit. Your physician will talk with you regarding returning to work or school. Return depends on pain levels and comfort with ambulation with crutches. The most important part of the rehabilitation program initially is making sure the knee gets complete extension (totally straight). Following this, the emphasis is to get your knee bending properly. The rehab program is just as important as the surgery in achieving a good result. Typically you will be in therapy 2 times per week for 3-4 months. In most cases, it will take six months to return to cutting and pivoting sports. When you are able to return to full duty at work depends on your job requirements. I will help to spell those out more clearly at your office visits. Will I need a brace after surgery for sports? If I do a good surgery, and you do a good rehabilitation, you do not need a brace after ACL reconstruction. Occasionally, I will have a patient that requests to use a brace of the first year, and that is OK. Overall, ACL reconstruction is a highly successful operation. The advances in surgical techniques and rehabilitation have led to a 95% success rate for achieving a stable knee following surgery. To Schedule an appointment with one of our Sports Medicine Specialist please call: (314) 336-2555.